This entry was posted in holster, light/laser, pistol, training and tagged AllOutdoor, laserlyte, woman. Bookmark the permalink. Good article but I recommend against any exposure to lead residual or solvents which rules out air guns using lead pellets and suppressed rim fires. So what instead? Airsoft using plastic pellets, paint ball guns or even the good ole rubber band gun…http://www.rubberbandguns.com/pistols/military-pistols. Decades of LE/EMS & HazMat work and research color my views on pregnancy and firearms as well as post pregnancy nursing and child care. Be informed and use caution. Note that I recommended suppressed centerfire pistols with TMJ ammunition. I also suggest having somebody else clean the guns. Airsoft is great for drawing practice and close-up trigger control. Addressed when my daughter was expecting and also bought her first handgun. 1. did not use a public range, outdoors and private shooting space is still possible to find in AZ, cuts down on airborne lead and noise. 2. wore a simple painters mask to keep from inhaling airborn lead (don’t know if it worked). 3. handled gun and shot with nitril gloves on to prevent lead absorption. Longsleeve shirt worn to cover arms. 4. limited firing to 50 rounds per session, couple weeks apart. 4. I did do the gun cleaning because of the chemicals. 5. 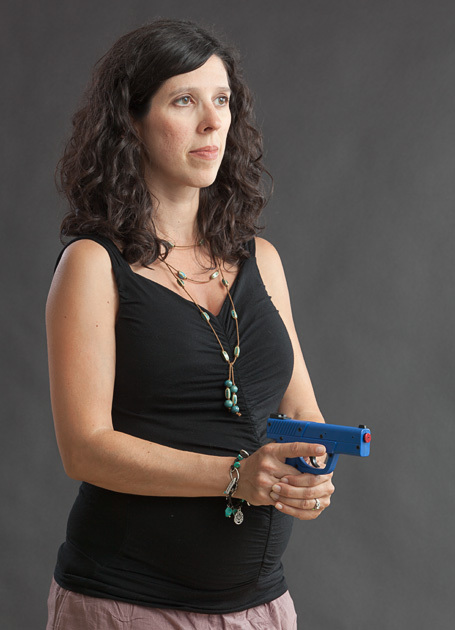 Carry option was a “Flash-Bang” holster that mounted center-line to the bra.